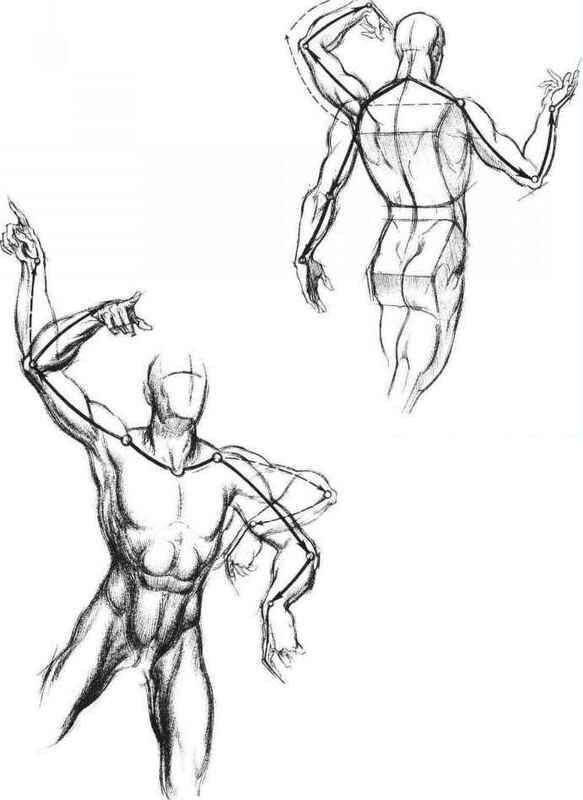 In our proposed sequence of figure sketching, we have so far discussed two stages of the notational order: (1) the torso masses, and (2) the legs. Now we propose the third factor in this sequence: the arms are third in importance in the sketching order. 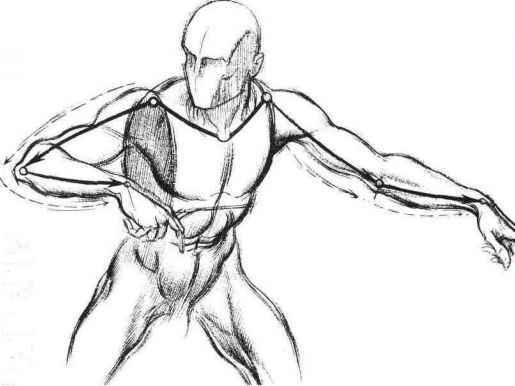 While movements of the arms do not cause major shifts of the torso or displacement of the legs, the arms are capable of great versatility of movement which cannot be equaled by the other members. No matter how they move, whether singly or together, parallel or in opposition, it is important, in sketching them, to see them as a unit, a bracketed or yoked pair of correlated members. Earlier, we spoke of the structure rhythm of the double underarm curve. This, together with tapered cylinder forms, is a rudimentary description of the arm. To this description, we will add the armature bracket, the connecting yoke of the linked arms. Linking the arms through the chest is no arbitrary device. The arms have no proper anchor to the skeletal frame. Free-swinging as they are, their position in the region of the shoulder is secured with fiber and tissue. The shoulderblade (scapula) to which the arm is attached is itself unanchored, and the lesser attachment of arm to collarbone is a variable connection. The arms at this juncture are independent of the frame, but the collarbone is anchored in the breastbone (sternum), and here, all the way down to mid-chest, the junction is firmly secured and cannot be displaced. The only real movement here is equal to that of a fixed hinge. For this reason, we conclude that the collarbone is a true extension of the arm, and we assert that the yoked arms are a proper use of this concept. In the small figure (upper left), the arms are indicated in strong line with a light line cylindrical overlay. The arms are linked through the chest barrel, from shoulder to shoulder, on the yoke of the collarbones. The large figure carries the schematic drawing, begun in the small figure, a step further. Cylinders are replaced by arm forms (dotted lines). The armature yoke of the coupled arms is still emphasized. The total figure has been advanced and tightened up. Here is another example of the linking of the arms. The smaller schematic drawing is taken to an advanced stag in the larger figure, reinforcing the interconnecting transit of the linked arms through the chest barrel. In drawing the amis, it is important to c the coupled amis in the collarbone yd. their structural rhythm. The structure amis, upper or lower, has a consists similar curved rhythm, starting from the the elbow. A double curve develops (set lines), holding to the underarm exterior of the member. Here, the double underarm curve and the linked arms are shown in a variable sequence. 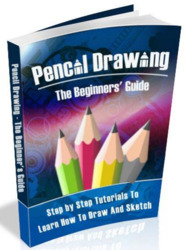 See how easily the arms are put into a concise form with these conceptual devices. since the collarbone yoke is obscured, we invert the armature and join the arms on the contours of the upper shoulder holding the boundaries of the trapezius muscles. The dotted line through the shoulders, from arm to arm, is added to show the torso tilt. Three rear view figures in completed form, drawn in notational sequence. The torso masses, supported by the legs, are followed by the armature yoke — inverted—on the shoulders. 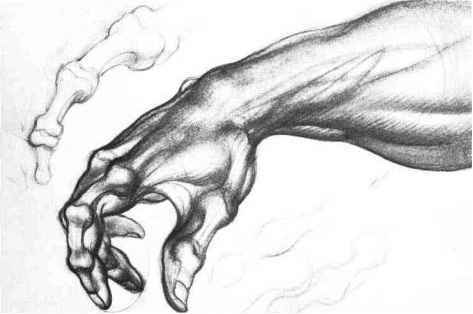 The student is urged to experiment with the linked arms (on this page, if necessary!) to test the facility of the approach. Here we see a notational sketch of the overlapping of arms, a problem not covered in the previous examples. The upper figure shows one arm over the other; the lower figure shows the am paired, flexed, closed, and folded to gether. The important thing to remem ber in the treatment of overlapping forms is the value of being able to see, transparently, the origin of at tached members and the construction of obscured parts. How to draw chest barrel? 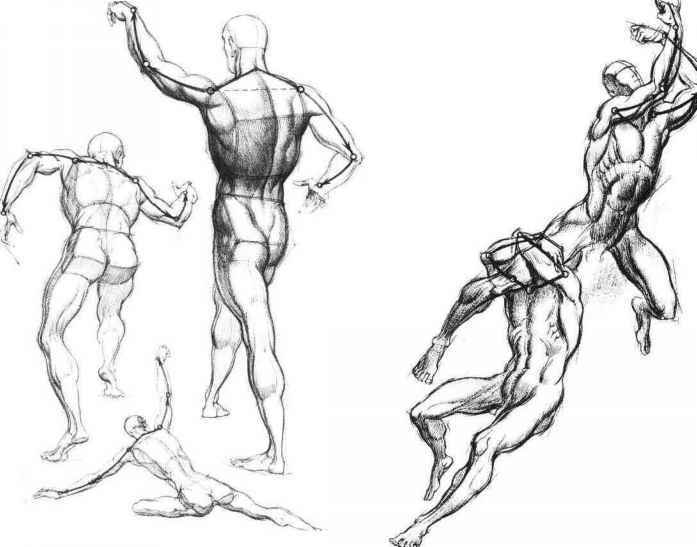 What is the importance of torso in figure drawing? 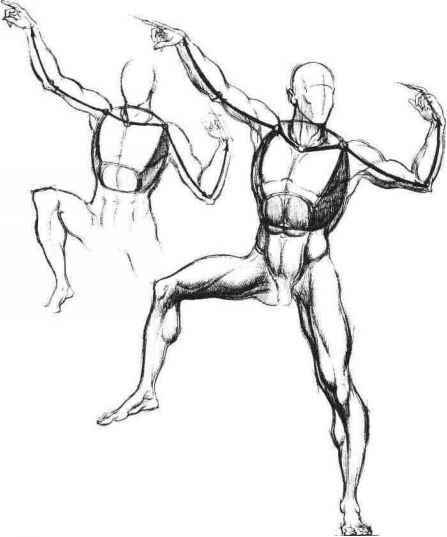 What are the important of torso in drawing? What is the importance of torso in life drawing?